DIRK Nowitzki is on fire. But don't worry, the 9-time All-Star from Wurzburg, Germany is in no peril. He merely lit up for 48 points to lead the Mavericks past the Oklahoma City Thunder, 121-112, in Game 1 of the Western Conference finals Tuesday night in Dallas. It wasn't like the Thunder didn't try to stop Nowitzki, they just couldn't. Not on this night anyway, when the 32-year old power forward dished one of the most spectacular performances in the history of the NBA playoffs. Unbelievably effecient, Nowitzki needed only 15 field goals, 12 of which he sank, to pile 48 points. And he made all of his 24 free throws, an NBA playoffs high that eclipsed the previous record of 21 free throws without a miss set by Boston's Paul Pierce in April 2003. . 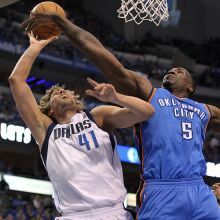 The closest thing that Oklahama did to slow Dirk was foul him. Sixteen times. "I was really looking to shoot early and was able to get my rhythm after the first couple of shots," said Nowitzki, who also finished with 6 rebounds, 4 assists and 4 shotblocks. No, this wasn't a homerun for the Mavericks, who shot 53.4 percent from the field (39-of-73) and 39.1 percent from 3-point range (9-of-23). Oklahoma led 27-20 after one quarter and came back from 16 points down in the fourth period to come to within 106-105 with 3:25 left to play. But Dallas put them away for good with big plays in end game, capped by a corner 3 courtesy of Jason Terry. Riding on the momentum of their Game 7 triumph over Memphis in the West semis, the Thunder played relatively well on the road. They hit 34 of 72 field goals, 7 of 16 triples and 37 of 43 free throws. They just didn't have an answer for Nowitzki. KEVIN DURANT was spectacular. He drilled 10-of-18 field goals and 18-of-19 free throws. He also made 2-of-5 treys, grabbed 8 rebounds and dished 5 assists. Durant finished with 40, while the Thunder scored 64 in the second half. And they still lost. And that's gotta be deflating. "We can't get discouraged," offered Durant. Easy to say. So hard to do. Because the Mavs are more than just Dirk. They're a team loaded with scorers, as proven in Game 1 when 10 players who saw action all contributed on the offensive end, not to mention providing fresh legs on defense. JJ Barea was a puzzle on legs, impossible to figure out. The 5-foot-10 dynamo picked-and-rolled the Thunder to death and scored 21 points in 16 minutes. Jason Terry added 24 while Shawn Marion chipped in 11. Durant, in contrast, had so little help. His runningmate, Thunder point guard Russell Westbrook, chalked 20 points. But Westbrook failed miserably in facilitating his team's offense, belting out just 3 assists against 4 turnovers. He also missed 12 of 15 shots. Game 2 of this best-of-7 Western Conference finals stays at the American Airlines Center in Dallas Thursday night.